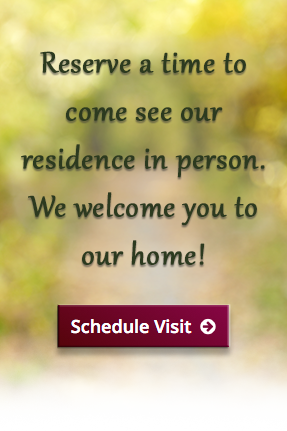 Questions About Living at Our Retirement Home? Review Our FAQs. Assisted living facilities offer a housing alternative for elderly residents who may need help with dressing, bathing, eating, and using the washroom, but do not require intensive medical and nursing care provided in nursing homes. At Aylmer Retirement Residence, it means you can be as independent as you want to be. You may come and go as you please, and live life the way you want to. At the same time, our retirement home offers a sense of community, a range of social activities, outings, a dining room where our residents eat with friends, neighbors and family members, and numerous care services to make life easier, such as laundry and housekeeping. Will I be able to bring my cat/dog in? We understand that pets are beloved members of your family, and we’re happy to welcome them for a visit to our retirement residence. Please ask about our pet policies before bringing your pet to visit the home as other residents may have allergies. What type of furniture is provided? We encourage residents to furnish their own suites. You can bring your own furniture, bed linens, towels, plants, toiletries, and anything else that will make you feel comfortable and at home. Is the retirement residence secure? All doors are secured at night. There is professional staff in the residence 24 hours a day. They will be available to check in on you to ensure your security. And should you need them, there is always someone at the other end of the phone. Do you have an “emergency” call system to use in case of problems? With the press of a button you will receive immediate attention from one of our care staff. Will there be air conditioning in my suite? Each suite has its own air conditioning and heating system, which you can adjust for your own personal comfort. Will I be able to bring my vehicle? Yes, you are welcome to bring your car. Designated parking spaces will be available for licensed drivers who have their own vehicles. These spaces are subject to availability, and additional charges may apply. To protect your privacy and to ensure security, we do not display a directory at the front door of Aylmer Retirement Residence, nor will staff give out your suite or phone number. We will be happy to provide you with more information regarding our privacy policies when you move in, or upon request. Yes. There are laundry facilities available in the retirement residence for your personal use. You may also choose to have our staff do your laundry on a weekly basis for a charge, giving you more time to enjoy other things that you would rather be doing. Anytime you want them to. Our dedicated staff are available day and night to allow your loved ones access to Aylmer Retirement Residence while protecting your privacy. Can I go out anytime I want? Of course you can. Aylmer Retirement Residence is an independent living retirement home. You may come and go as you please. For fire and safety purposes, we just ask that you sign out when leaving and sign in once you return. The sign out/in book is located at the Entrance. What if I want to have family in for dinner? Family and friends are welcome to join you for a meal in our dining room anytime. We ask that you notify the Front Desk so that they may ensure that a table is set up for your company. Payment may be arranged through our Front Desk. Can I have a family member stay with me? If you have adequate extra space in your retirement suite, you are welcome to have a short-term guest stay for a limited amount of time. For fire and safety purposes we ask that you notify us of the arrival and departure dates of your guest. We ask all residents of Aylmer Retirement Residence to sign a lease in order to ensure everyone is aware of their rights and the standards of the seniors’ community. At that time, the charges for all services will be explained and provided in writing to ensure you are provided with complete financial information. However, you are not held to a long-term lease at any time, and we will request only 30 days notice if you wish to leave our retirement home for any reason. We are always here to help make your stay with us more comfortable. If you have any other questions, don’t hesitate to contact us anytime.